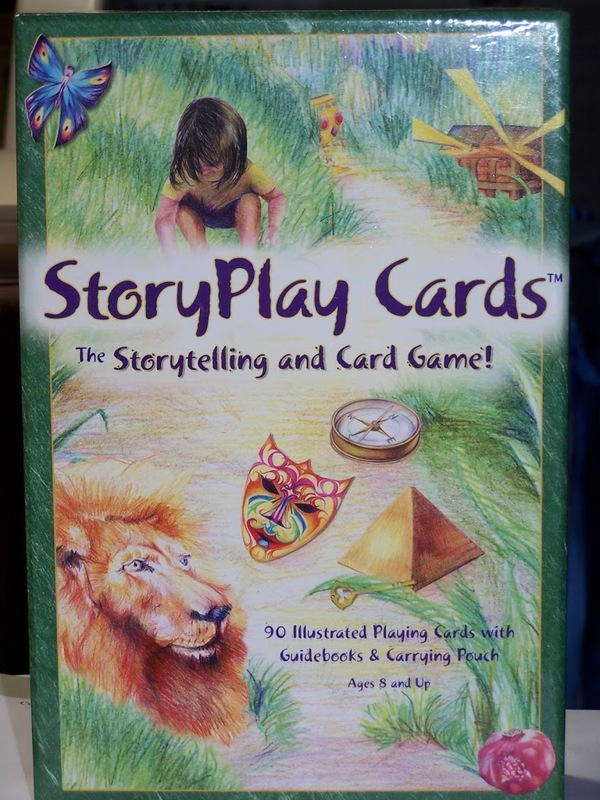 Five Stars for the StoryPlay Cards by Think-a-lot Toys!! www.think-a-lot.com (while you are visiting their site sign up for the free newsletter you might win a Think-ets game. I opened the box with such anticipation for the fun it held inside. I was not to be disappointed. I took out the double deck of cards and began to flip through the images with associated word at the bottom. I could envision the story games we would have. My first play was a set of cards dealt to a group of students in a high school. We created the decks inaugural story as a group. The tale wound through mystical and imaginative places with an athlete as the main character. The group was reserved about the possibilities at the outset but begged for a second round on closing the first story out. We had a good time, our second play with an assigned curriculum based topic from World Civilisations class. The story was creative with references to the ages being studied in different classes. It was a great way to make the material more lively and give them a chance for recall practice. I moved on to another group of students and here we tried a game similar to Go Fish using the color borders and the full deck. There was a great deal of cheerful banter when a prized color was discarded. The next group we played a memory concentration game with a part of the deck that were 14 pairs by association. 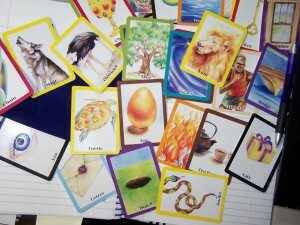 For example one card was a tree its pair was roots. The star card was paired to Cosmic explosion. There was word association along with the memory component. The same game was enjoyed by grade school aged children. My third adventure with the Storyplay cards was a Storytelling Course in the English Dept. at Eastern CT. State University. My visit to the college class as a guest speaker was a prime time to take 20 minutes mid class and see how story games were received by the college set. I had five different games going in the room and they were well received. I was listening in on the team playing StoryPlay Cards and found they were creating a dynamic tale with laughs and a very creative process. There are so many possibilities with the StoryPlay cards in the classroom setting , but I can see wonderful opportunities with family games and in senior settings.